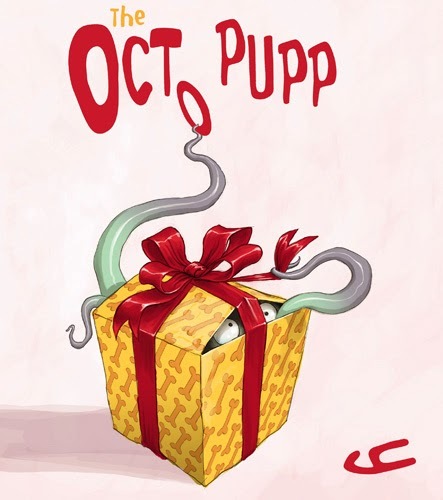 Winners have been drawn in the exciting Goodreads Octopuppy giveaway. Three lucky recipients were plucked from the 1,700 entries. Copies of The Octopuppy book are now on their way to the prize-winners in: California, USA; East Java, Indonesia; and... Lincolnshire, UK! I hope each winner enjoys the book. And so! Here we are in a new year, and there's plenty going on. My posts on here have been a tad sporadic of late, mainly because I'm busy wrestling with my next book, like Johnny Weissmuller throttling a rubber crocodile. More on that as soon as I can reveal stuff. In the meantime there's still loads of Octopuppy material I'd like to share with you on here, but to keep these goodies coming it's likely I'll be limited to a weekly post. It could be any day of the week at any time of the day or night... but that's how I like to keep you guessing, creeping out from behind the curtains to quietly bludgeon you with a kumquat in a sock, when you least expect it. So keep 'em peeled, right? What tool? This tool! Smash! Any other reasons why you have gone quiet?! Perhaps one other significant example of creativity. That, plus my tongue removal prior to mummification.